This article will keep you informed about changes to Zendesk reporting. These changes might affect the reporting options you have available. If you have a problem or question, please leave a comment below. Use this article to help you understand the reporting options you have with your Zendesk products and plan level. You can access all of your reporting products from the Reporting page ( ) of the Zendesk Support console. 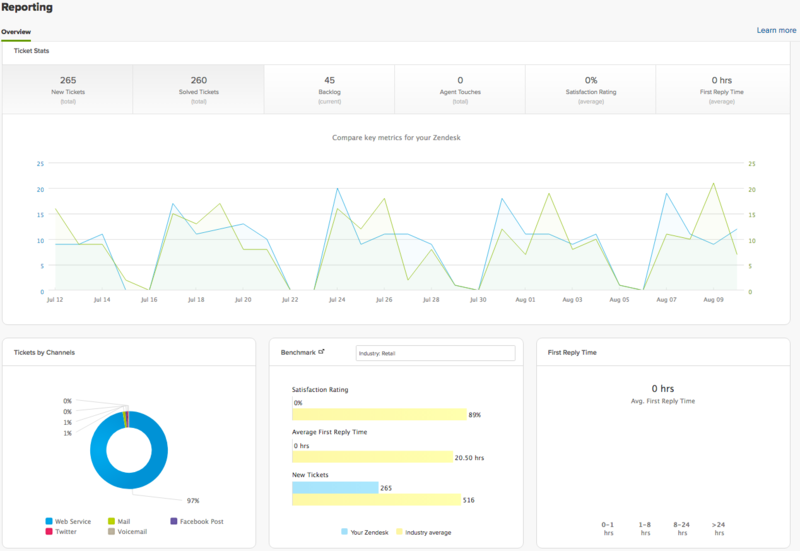 Explore Lite contains pre-built dashboards containing best practices reports for your Zendesk products. Explore Lite is included with all Support Professional and Enterprise plans. Explore Professional extends Explore Lite by enabling you to create, share, and secure your own customizable reports. Explore Professional is an add-on for Support Professional and Enterprise. To learn everything you need to know about Explore, see Zendesk Explore resources. Insights is included with Zendesk Support Professional and Enterprise. Insights extends the capabilities of the built-in reports to let you build, customize, secure, and share your own reports. If you purchased Zendesk Support after November 13th 2018, you don't have access to Insights. Tip: When you activate Explore, Insights, and any reports you created using it are not removed. However, in the future, Explore will replace Insights, so we encourage you to start migrating any reports that you want to keep. For more information about Insights, see Zendesk Insights resources. You have not yet been upgraded to Explore (there are currently some limitations to implementing Explore. If you are not automatically added, contact support@zendesk.com for help). You want to maintain custom reports you have not yet migrated to Explore. See Upgrading from Insights to Explore for help converting these reports to Explore. Additionally, we've published many recipes that help you get started writing custom reports with Explore. Built-in reports are available with all Zendesk Support plans. To view the built-in reports, open the Reporting page ( ) and select one of the available tabs, which differ depending on the Zendesk products you have installed. 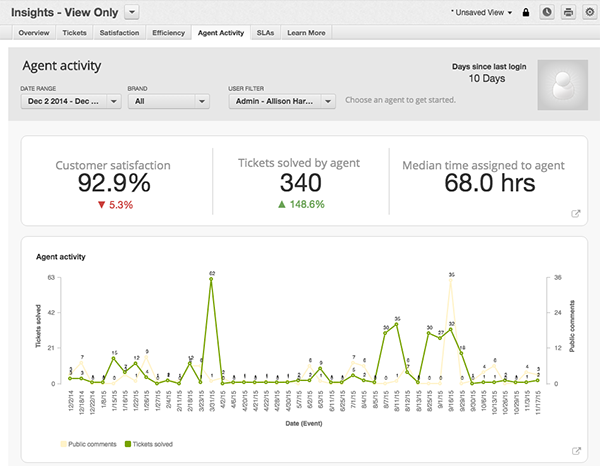 For general information about agents and tickets in your company, choose Overview. Tip: When you start using Explore, the Overview, Leaderboard, and Satisfaction tabs are removed from the built-in reports. You'll now use Explore to access pre-built dashboards containing this information. See Getting started with pre-built dashboards. 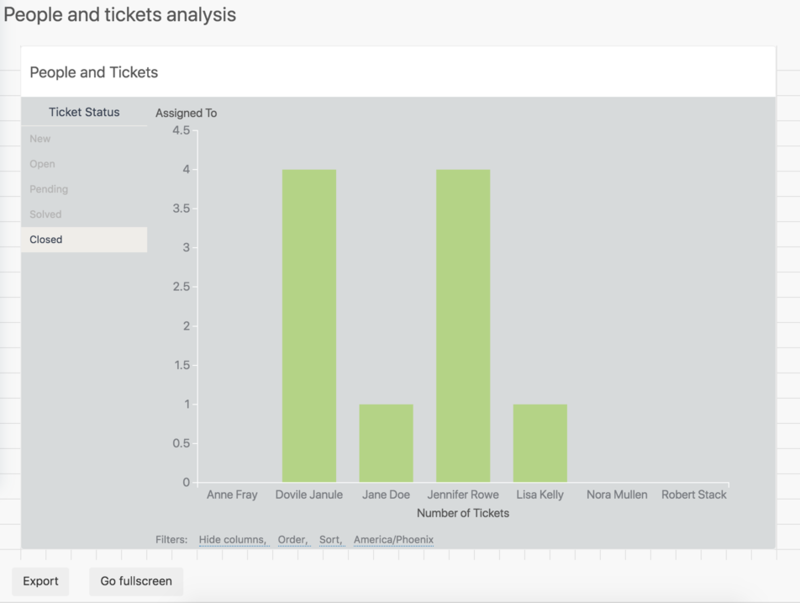 For more information about the Zendesk built-in reports, see Using the Reporting Overview. We have been a ZD customer for ~7 years now on the "plus" plan and have had access to Gooddata reports, which changed to "Insights" and is now completely gone. We have ~100 reports that exist there and no way to access to them. Now if I don't upgrade to "explore", which requires a plan upgrade, are my reports lost? Was there any notification that this transition was going to happen? I am feeling like my reporting system is being held hostage at the moment. Hi Zeb! I'm sorry to hear this is happening, but I don't think what you're seeing is intended. We don't have any plans to sunset Insights/GoodData at this point (see https://support.zendesk.com/hc/en-us/articles/360002032327-The-future-of-reporting-for-Zendesk-products). I'm going to create a ticket for you so we can investigate why you've lost access!